From Burwash Landing to Fairbanks Alaska proved to be a long day. Our usual pace was quite leisurely. We enjoyed the sights and got there when we got there. This day was different. I wanted to find some fiberglass filler to complete the patching on the wheelwell in the camper. 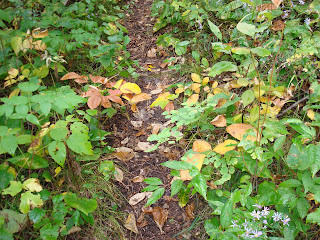 We arrived in Fairbanks around nine o'clock, set up camp, ate supper and took a stroll around the campground. We like to see how the better half travels. Then we decided to play some 500 till dark. It turned out there was no dark. "I think I'm gonna call it a night. What time is it?" asked Troutbirder. "It's 2 a.m." was the incredulous reply. The Land of the Midnight Sun for sure. We spent several days in Fairbanks. Highlights included Alaskaland, an arboreteum at the University, a buffet featuring reindeer stew and freshly caught halibut, a slide show about the aurora borealis, and the Malamute Saloon, which had a cabaret show. 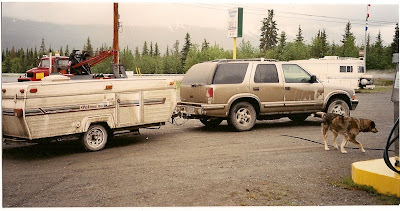 The next day after our stay at Burwash Landing it was once again on to Alaska. Haines Junction was next up the road and there was a Ranger Station-Museum where we were introduced to Kluane National Park and Preserve. Beyond that, to the west in Alaska, is Wrangel-St. Elias National Park and Preserve. These gigantic wilderness parks are basically accessible only by backpacking and boat. 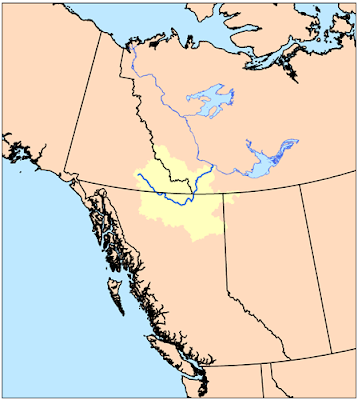 The headwaters of the Liard River lie in the mountain range straddling the B.C. - Yukon border. This large river flows eventually into the mighty McKenzie and thus north into the Arctic Ocean. We crossed a large suspension bridge over the river and then followed its course north to Watson Lake. A neat lunch stop on the way was at Rancherra Falls Recreation Area. 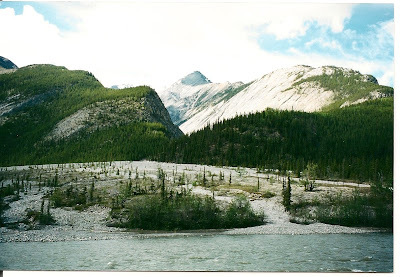 The Liard has carved a beautiful valley through the mountain foothills. 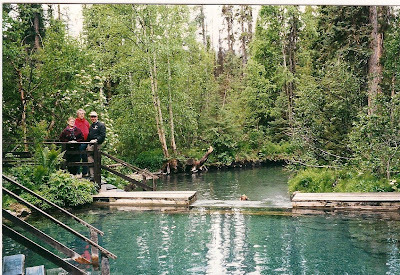 A highlight for us was a stop and a swim in Liard Hots Springs. 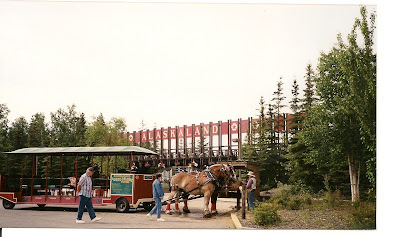 This was also a favorite place to "take a break" for the thousands of military and civilian workers, who first pioneered the Alaska Highway through a seemingly intractable wilderness. This was done in 1942 because of the threat of Japanese attack on Alaska. Down stream towards the board walk the water temp. was very comfortable. Upstream it got hotter and hotter till you could reach the parboiling point. On the tragic side, the boardwalk from the parking lot to the springs, was the scene of where an emaciated black bear had attacked and killed two tourists several years before. This whole area is abundant with wildlife and exotic plants, including 14 kinds of orchids. Later that afternoon we stopped to camp along another alpine lake. Thinking of a quick swim that evening I dipped my toe in the water, I determined it to be colder than Lake Superior. A lot colder. But what a view! We slipped into the small community of Burwash Landing late that afternoon after a long and somewhat difficult day. 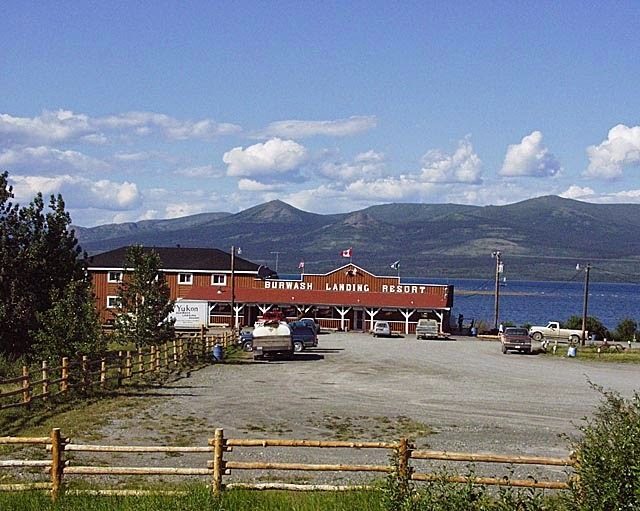 The community was located along the Alaska Highway in The Yukon Territories, Canada. It was on the shore of beautiful Kluane Lake. Here’s the story…. We’d had a quiet morning heading north to Alaska when we ran into a hailstorm. The hailstones weren't big or dangerous but made a very loud drumming noise in the Blazer. In the midst of all this another vehicle pulled alongside us, the occupants waving frantically and pointing back to our popup camper. I pulled off onto the muddy shoulder and we waited till the storm abated. Sure enough, I had a flat tire and a badly damaged wheel. What to do? Jack it up and put the spare on. Not so easy. The wheel and back axle was buried in the mud. I needed a shovel to dig it out and get the jack underneath. Of course, I carried a shovel with me all the way to Alaska. NOT! 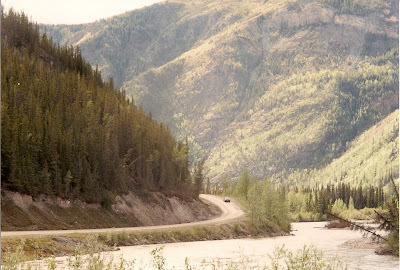 This is where our unlucky day began to turn as we stood forlornly along the highway in the Yukon wilderness. We had waited about 10 minutes before a truck appeared in the distance. It turned out to be a Yukon Territory Highway Maintenance vehicle and the driver had a shovel. We were business to get the spare on. The driver also had the advice that our best bet was to head back to Whitehorse where they surely would have a new wheel. It was only 100 miles back down the highway. We’d been heading south for about twenty minutes when we entered another very small town. It was then that I noticed among the ramshackle buildings two gas pumps. We “filled er up” Mentioning our recent problem and Whitehorse destination he allowed that he “just might” have a tire replacement for the camper. He did. And he mentioned his friend “Joe” down the street had a “junkyard” where one, though unlikely in this case, could just about find anything. “Anything” turned out to be a very functional wheel. 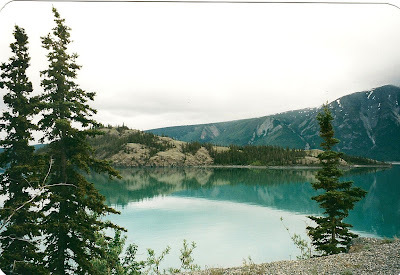 Beautiful Kluane Lake adjacent to a National Park along the Alaskan Highway southwestern Yukon Territory. With such name as 'Nevermore',"
Our companions Gary and Rosie enjoying the vast vistas. The road began to rise to the heights of Stone Mountain, where naturally we saw stone sheep grazing near and on the highway. 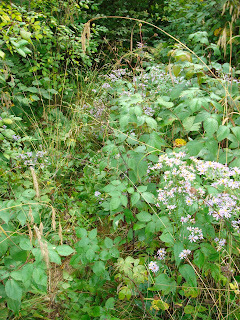 It was early June and wildflowers could be seen everywhere. When you see bears though caution rules against heading to far away from the roadway. It was a rare occurence when I saw more than one car or truck at a time ahead or behind. I love this kind of driving. 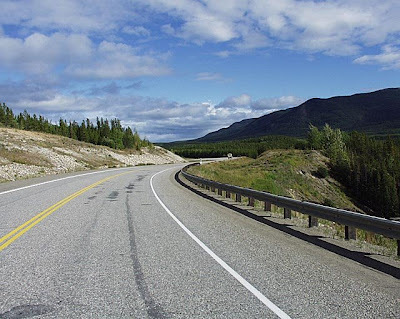 The Alaska Highway runs from Dawson Creek, British Columbia to Delta Junction, Alaska, via Whitehorse, Yukon. Its historical length as of all-weather completion in 1943 is 1,523 mile(s) long. 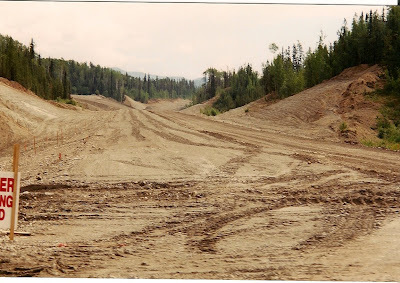 The historic ending of the highway is near milepost 1422, where it meets the Richardson Highway in Delta Junction, Alaska, about 100 miles southeast of Fairbanks. 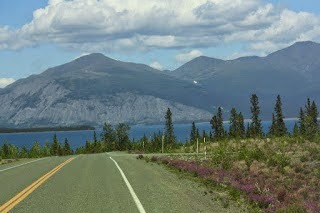 The Alaska Highway travels through some the most beautiful and pristine landscapes in North America. It's size and beauty largely defies description. 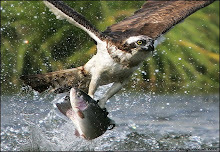 There are forest and mountain vistas, wild animals, 424 species of birds, wildflowers, mighty rivers and small streams. You name it. Come on along a take a look circa June 2000. Actually, it wasn't all that bad. A ten minute wait and then an official pickup truck guided us through. Fifteen hundred miles and one construction delay. No complaints there. We camped that night on the shores of Lake Teslin, Yukon Territory. Just one of many very nice campgrounds we enjoyed. 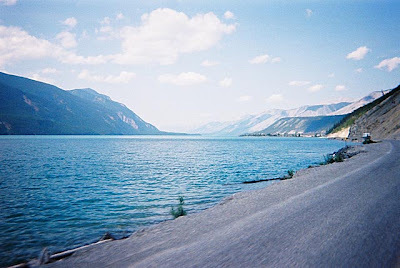 The lake, tucked between two mountain ranges, is more than 30 miles long. It's bright and sunny today in Bluff Country. Yesterday we seemed to be unable to agree on a fall vacation trip. 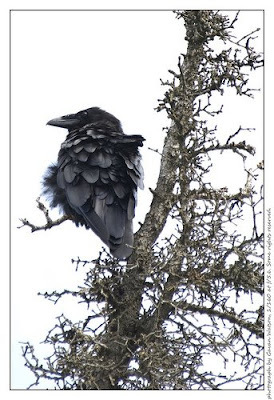 A second trip to Alaska is on the agenda but our thought has always been, we would go back and the second time do the inside passage cruise thing..... but that's for "old people" and we are not quite there yet. Mrs. T wants to go to Ireland. I favor a couple of weeks beachcombing on Vancouver Island, barefoot in the sand looking for whales. Well, time will tell. In the meantime, I've been looking through some of our old travel albums. 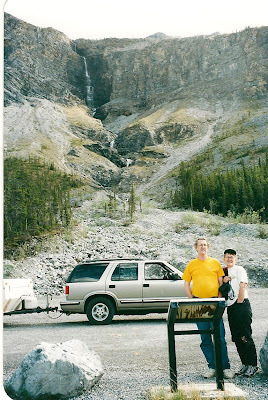 We had gone to Alaska almost a few years ago now, with our good friends Gary and Rosie. We drove up and back, camping all the way. The trip took over a month but we weren't in hurry. It was summer vacation. Rosie kept a diary. This morning I can't find my copy. Maybe I'll just reminisce and wing it! I had a white Blazer in those days. And after many decades of tenting we decided to get a Palimino pop-up camper for our "no more laying on the ground Golden Years." It was heaven. We made it the first day all the way to the Black Hills. After supper, the campground host came around and said their was a free shuttle bus to Deadwood - the Sodom and Gommorah of the West. I won $25 dollars in nickels that night. The trip was off to a good start. 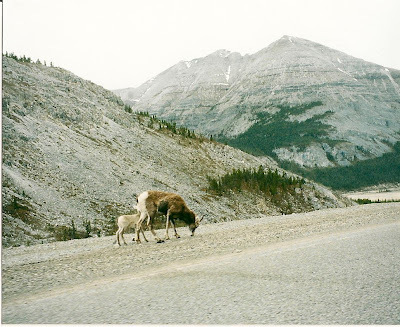 The next day we headed northwest to the Canadian border. I love Montana, particularly the troutfishing mountain region of the southwest. The eastern and central portions of the state are flat or rolling hills and grasslands. 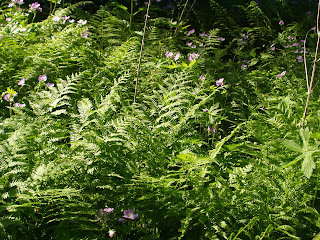 In early June, it was green everywhere. 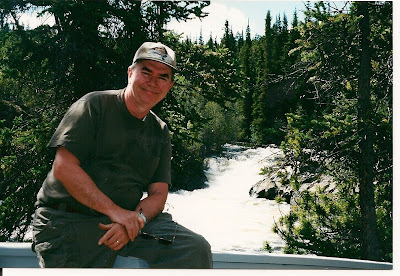 We camped along a creek near the Canadian border. 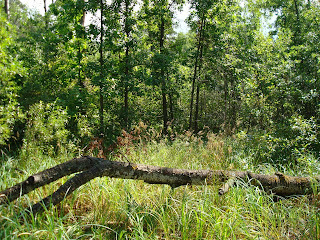 It is along drainages where you find just about the only trees in this country. 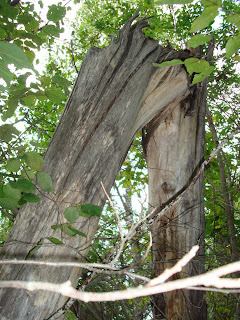 Lewis and Clark cut down giant cottonwoods for their canoes along the Missouri. 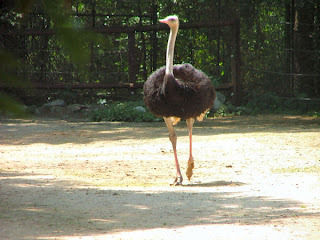 Checking the creek for fish, I ran into an ostrich which had the run of the campground. Strange! We spent the third night in a campground a little north of Edmonton, Alberta. We had a late supper and then hiked the area, checking out all the big rigs. They made our pop-up look rather dinky. It was after 11 when we decided to turn in and it was still light out. 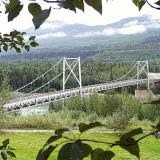 Our goal for the next day was Dawson Creek, British Columbia. 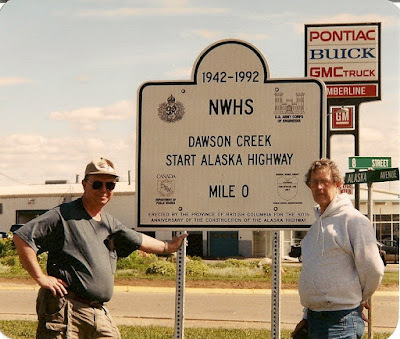 Dawson Creek is the point of origin of the Historic Alaska Highway, which stretches north to Fairbanks in Alaska. As a defensive mesure against Japanese invasion, starting in March 1942, and working swiftly from both ends, American Engineer Troops (10,000) and construction gangs under civilian contractors (6,000) completed the Alaska Highway in November 1942. Overnight, Dawson Creek mushroomed into a boomtown. I remember the old saw about it not being arriving at your goal but the journey to reach it that is the best part. This was certainly true in our case. We were also given the usual dire warnings about bad roads, running out of gas, bringing extra tires etc. No way! I've seen much longer spaces between gas stations in North Dakota. The Alaska highway was good. Yes, there are stretches of road construction but where in the U.S. aren't there some? Now, if you need a new transmission, of course, its is a long way between major cities. 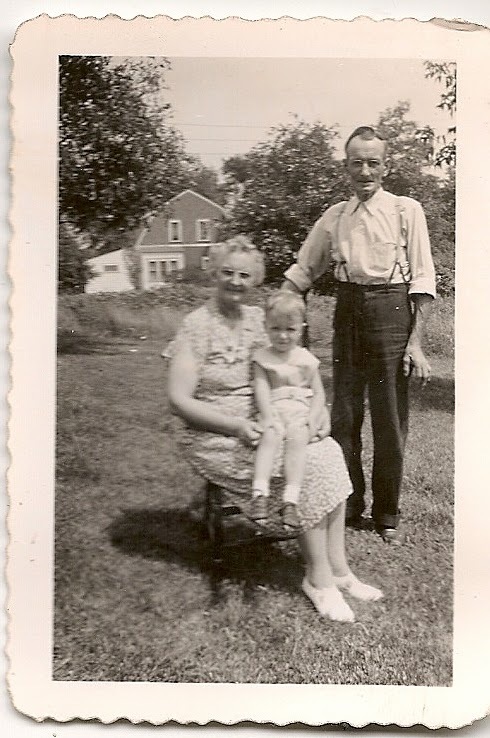 My maternal Norwegian ancestry grandparents. In a particularly nostalgic mood this morning, I harkened back to my childhood and some of my mom’s Norwegian style cookery. Our household was divided between the Germanic culinary leanings of my father and my two younger brothers and me and my mom’s Scandinavian favorites. Of course, those were the days before pizza and fast foods were yet widely known in America. I even told my mom occasionally I liked her to make lutefisk. This was a stretch because the taste of salted half decayed cod, with the consistency of Jell-O, left a little to be desired. Still, I think it made her day to know that someone else in the family would eat the stuff. This morning though my thoughts turned to something she called Klub, also known in the Upper Midwest as Kumla and a variety of other names. I loved it. It’s basically Norwegian potato dumplings. There are dozens of recipes on the internet for it today. Most are incrementally different but add up to the same thing. I stick with mom’s recipe. Then you mix the potatoes and flour in a large bowl to the “right consistency.” That’s the tricky part that took some practice. Your make balls a little bigger than golf balls. Too compacted and you get a heavy golf ball to eat. To soft and mushy it separates and floats to the top when you drop it in the boiling water. Remove the pork for a while giving the dumplings room to do their thing…. :) I give each boiling step anywhere from thirty minutes to an hour obviously depending on whether you used a precooked bone in ham or not. 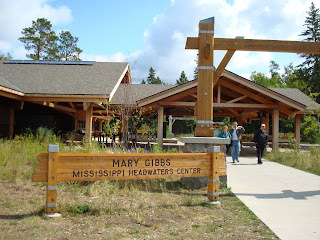 Mississippi Headwaters Center. 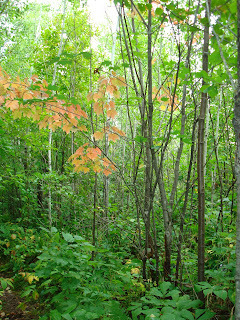 It is ground zero of the crown jewel of Minnesota's State Parks - Itasca. headquarters on beautiful Mantrap Lake. We learned the history of the park, along with doing the usual "see I can jump across the Mississippi River", thing. auto tour through the vast forest, focusing on locating some of the parks record size white and red pines. decided to check the trail out. 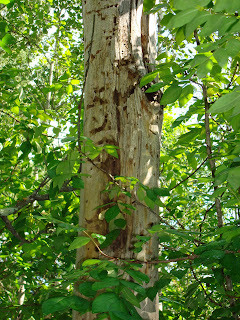 National Forest, felling million of trees, causing much property damage and human injury. 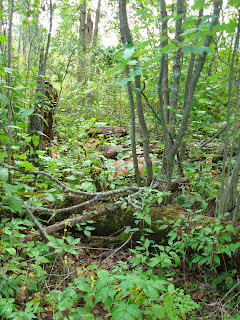 Throughout the area the felled trees posed a huge potential fire danger for the future. 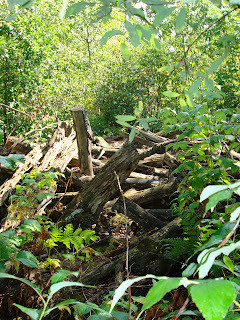 In the park a decision was made to have loggers salvage and remove much of the downed timber. 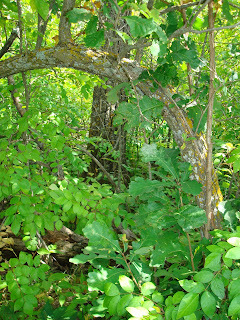 forest looked like in the aftermath of the storm and to reveal the natural process of recovery directed by the hand of Mother Nature. 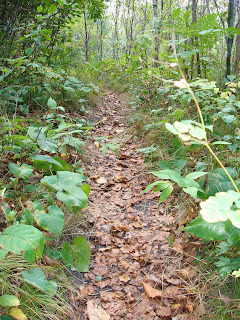 You are invited to come along as we hike thru the area. so stay close. I don't want anyone to get lost! We will stop for pictures along the way. Now into "the forest primeval." dinner at the German restaurant near Akely. 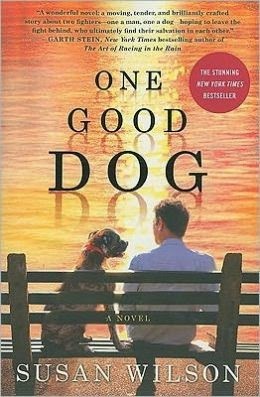 One Good Dog, a novel by Susan Wilson. 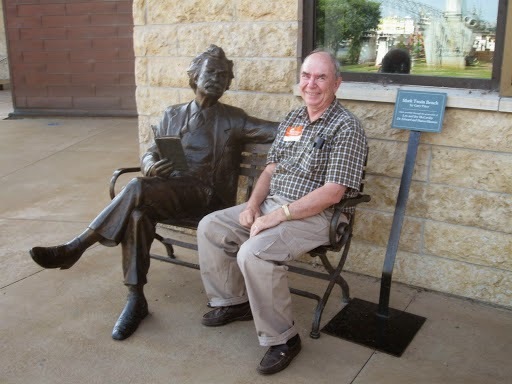 You can read the review now by clicking on the picture of Mark Twain above.